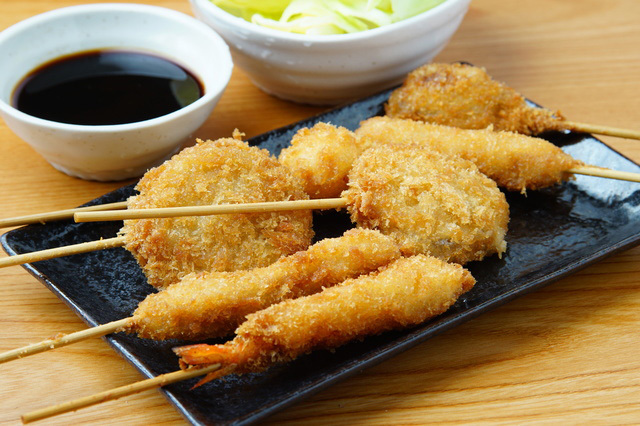 Kushikatsu is a fried snack you can enjoy in some famous izakaya chain all over Japan. This snack is ranging from eggs to onions being deep fried and skewerd then dipped into their special sauce. Kushikatsu Daruma is the most popular of all, especially if you go to Osaka, this place is a must-visit restaurant for most tourists. If your tour leader brought you to Doutonburi, mostly they will have you queue in long line to taste this dish. At first I thought this restaurant is a tourist trap, but now I know why many tourists are eager to wait on long lines to just get a taste of this snack. I would suggest you to have this dish in Shinsekai area instead of Dotonburi, they will have less queue. Deep fried snack is always Indonesian’s favorite. Hence, we have lots of people on cart selling deep fried foods here. But, you should say that Japanese makes everything in better quality, including the batter and sauce. “This dish is simple yet are elevated to new levels”, said famous food blogger Mark Wiens in his food travel journal, “Migrationalogy”. On my first visit to Shinsaibashi area’s Daruma, it was around 2 pm so it wasn’t so packed with humans, at around 4 pm, people starts queueing, waiting to get in. Kushikatsu Daruma is so popular that it is always packed with loyal patrons (locals and tourist alike). The restaurant itself is not fancy, and quite noisy because everyone is busy talking, drinking, and ordering food. It the type of Osaka snack food that you go to eat and socialize, drink eer, and enjoy some tasty junk food style deep fried skewers. The serving system is quite high-tech as some branches use iPads to order the menu. They even have the food transferred from the kitchen to the table through the ‘conveyor belt’ beside our table. But again, only several branch has this technology. When you land yourself in this restaurant, there are some special rules that you need to follow. 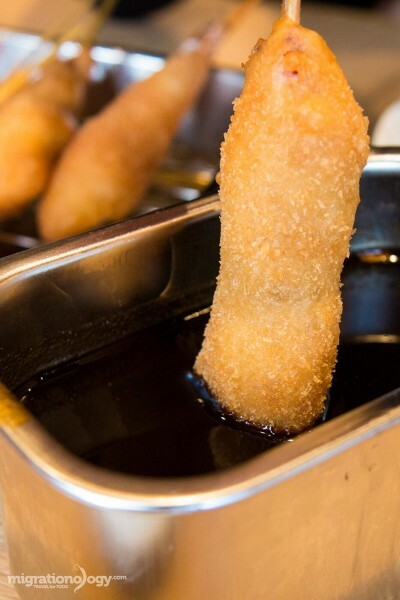 Dip the kushikatsu in a sauce. 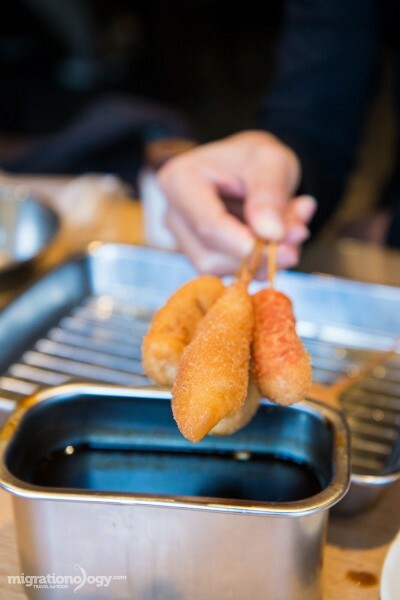 However, the sauce is usually shared between customers, so for hygienic reasons, you aren’t supposed to dip kushikatsu that you have put in your mouth into the sauce back again. Usually the container will have mark “DON’T DIP TWICE”. When you order kushikatsu, it will come with a bowl of cabbage. These cabbage is not finely cut, and it helps you to pour the sauce to the kushikatsu. You cannot dip the cabbage to the sauce twice either. What menu does this restaurant offer? This place is famous because people can drink beers all along with the oily kushikatsu. You will find a variety of beers along with many types of skewered deep fried nuggets. The menu is typically made up of meat (beef, pork, chicken), fish (prawns, octopus), quail egg, and vegetables which includes onion, lotus root, asparagus, eggplant, small green peppers, and shiitake mushrooms. The sauce of kushikatsu are liquid black and maybe dipping it a little to check whether you’re okay with the taste at first. Personally I really love the sauce. The sauce itself is a mixture of Worcestershire soy sauce, but I think they add some sesame oil in it. It is sour, salty, and sweet; totally blend well in your mouth. Some restaurants do offer deep fried fruit and their own original dishes, like what I have tried before when I went to Daruma’s shinsekai. They have this delicious side dishes too which looks like stew called Doteyaki. Doteyaki is beef tendons and daikon radish dish which is simmered with miso sauce. 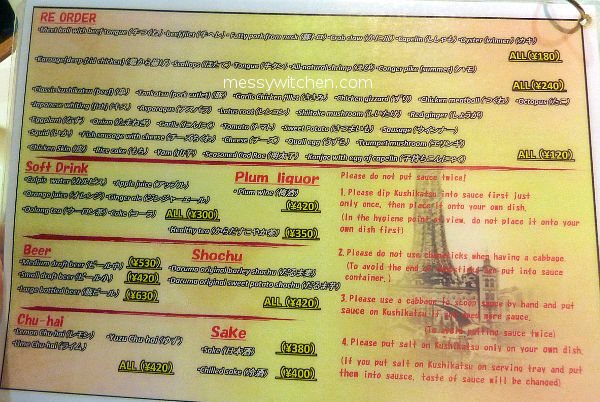 Not all staff can speak English, but you can always ask for an English menu. Another problem is the sharing tray. 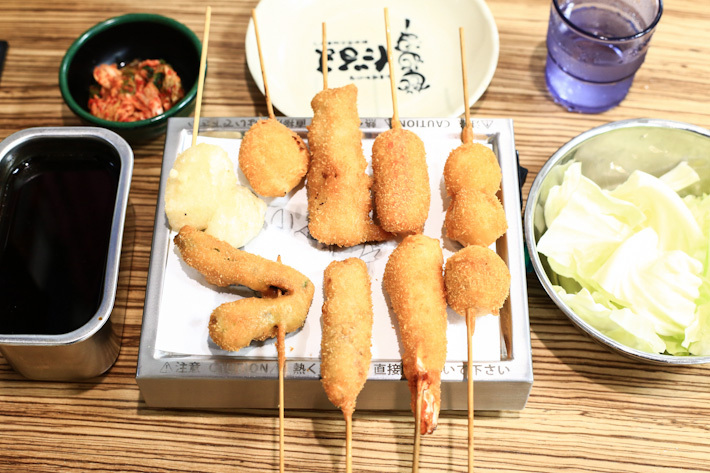 With the sharing tray of kushikatsu when you buy a platter package with your group, you will have no idea which ones are yours because they have been breaded and fried. The price of kushikatsu skewers are ranging from 120 yen to 240 yen. You can get free water, but I suggest you get a glass of beer instead. On a side not, an average set is around 1800Yen for 12 sticks and a side dishes like doteyaki. If you are looking for another experience gulping a fried dish in Japanese style, it is surely worth your yen.